Second Effort: You thought ants were bad at a picnic? oh how i hate those little buggers!!! i had the wee teeny tiny ants and the bug man tried and tried to get rid of them. if you left a single crumb they would be a brown ball of yuck like white on rice. finally they just disappeared about five or six months ago. hope they stay gone too! and you KNOW how sorry i am about the cake too! Talk about being late to a party! I finally had the chance to come over and read this post after first reading your post about your ordeal with image attribution as even though you were kind enough to leave the links in the comment section on one of my posts, it took me forever to remember to click on them! I tell ya, this getting old stuff is simply not for the birds as I truly used to like having a "sharp as a tack" memory and now I possess one that's not sharp enough to slice through water. See? Even my witty expressions make no sense! 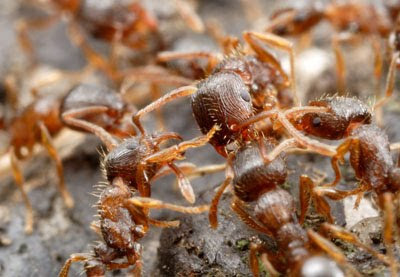 Anyhow, I wanted to say that a) that image of the ants is very cool indeed and I can see why you wanted to use it and b) I am so, so, so sorry about your loss of the German chocolate cake. I'd hate ants too! Additionally, great lesson on the image attribution post; I suspect when that gal used my photos on her blog after calling me "less rule-worthy" did that I could have called the Blog Police in on her, too, but I'm glad I didn't have to go that route. It's funny though, I never would have even noticed that she'd used the photos had someone else not posted a link to her blog that I came across so I wonder how Mr. White was able to find out that you had used his ant image? Is there some sort of tracking one can put on their photos? Anyhow, all blathering aside, I just really wanted to stop by and say 'hi' and thank you for commenting on my post ... almost three months ago ... yikes. Linda, better late than never. And this is one of my favorite posts -- naturally it would be the one that Blogger would pull off line (albeit temporarily, thank goodness). As for Mr. Wild's tracking, I think he may have done Google image searches, just like I did, only he was looking for his own images. I'm guessing that this blog has been around long enough that images used here will show up pretty high up in Google image searches. He clicked on his image, found the link here, and took the steps that I described in this post. It's my good fortune that he proved to be such a good sport after I explained myself.